I have suggested that Helen Parker was the driving force behind the discovery of the Poweshiek skipper. She probably discovered it initially and knew that it was a new species. She may have written the description, or at least assisted Henry in the task. Part of the reason I suspect this is my assessment that Henry was sort of "tone deaf" when he wrote about nature. He did not seem to be all that interested in writing about the study of nature, especially when it came to invertebrates, in spite of his position as a professor of biology and other natural sciences at Iowa College. My assessment of Henry's abilities is difficult to prove and may in fact be wrong. What can be proven, however, is that Helen had a great interest and ability in the study of nature, and especially invertebrates. She wrote three books about invertebrates. The only one that seems to be currently available in a digital form is Rambles after Land Shells. It was published by The American Tract Society, whose mission is "to provide relevant tools for presenting the gospel". In other words, the mission of the publisher is religious. One might ask, what do terrestrial snails have to do with the study of Christianity? My answer to that question would be "nothing, really." Although Helen does fill the book with religious instruction, I would suggest that the real reason she wrote the book was that she was quite hooked on the study of snails, and had no other outlet. This book resonated with me because of my own interest in terrestrial snails--I have included in this website a treatment of Iowa's terrestrial snails. This snail corresponds with a snail we have here in Iowa which is called Neohelix alleni. 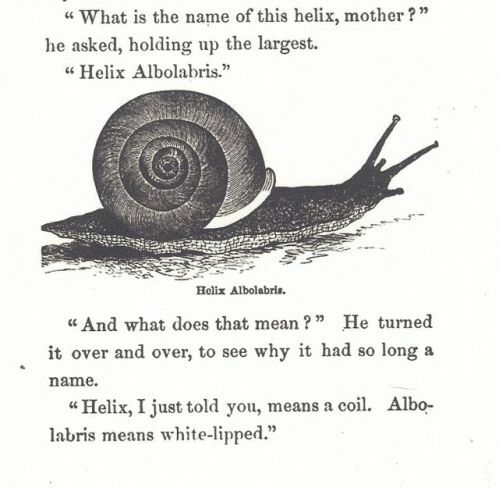 In this story the mother talks about a snail the child found, uses the scientific name of it, and describes briefly what the name means.